Robert Baldwin, author of Life and Death Matters: Seeking the Truth About Capital Punishment, will speak at the closing ceremony of the Witness to Innocence annual convention in Birmingham, Alabama on November 15. Dr. Baldwin’s talk, entitled “How I Changed, How You Can Change Others,” describes his personal spiritual journey–from a belief in the legitimacy and social value of execution to his present-day position that the practice is morally and socially wrong. In his desire to advocate on behalf of those facing death-row sentences, he teams up this month with Witness to Innocence, an organization dedicated to bringing attention to those who have been wrongfully convicted and sentenced to death for crimes they did not commit, and later exonerated of the charges. Twenty-five such death-row exonorees and their families will be present at the convention. 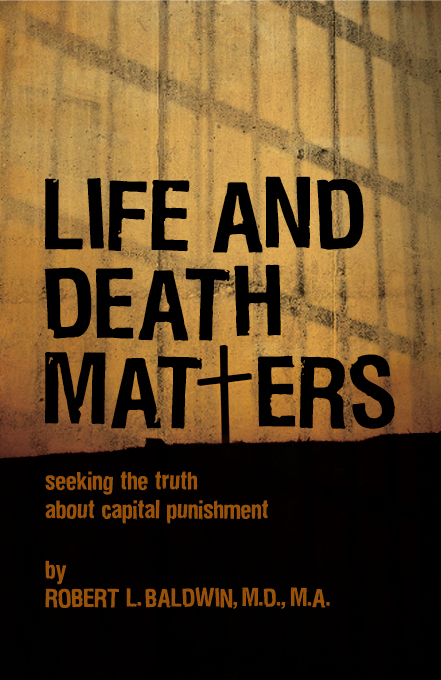 Life and Death Matters is also a featured “New Book” on the website of Death Penalty Focus, an organization which seeks alternatives to capital punishment. Life and Death Matters is available from NewSouth Books, Amazon.com, or your favorite retail or online book seller. You are currently browsing the archives for the Life and Death Matters category.